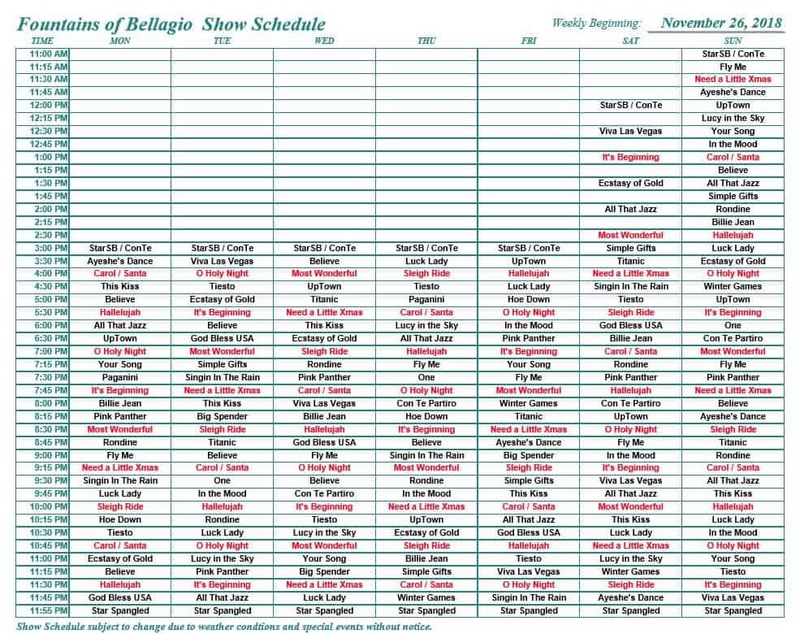 Bellagio fountain schedule may vary. Shows are subject to cancellation due to high winds. Title: Singin’ in the Rain. Artist: Luciano Pavarotti. Composer: Vicenzo deCrescenzo. Artist: David Foster. Composer: David Foster. Artist: Elton John. Lyrics: Bernie Taupin. Title: Hayaneh: Suite: Dawn, Ayeshe’s Dance. Title: Overture/And All That Jazz. Title: Footprints, Rocky, Red Lights. Title: We Need a Little Christmas. Artist: Johnny Mathis. Composer: Jerry Herman. Title: It’s Beginning to Look a Lot Like Christmas. There are small robots (called oarsmen) that control the direction of the nozzles, and the computer system works like a stage manager or performance choreographer.Despite all the cutting edge technology that goes into the fountains, though, some of the biggest maintenance challenges revolve around the more mundane components.With thousands of people gathering around the lake for each show, unwanted items find their way into the water and down to the filters. 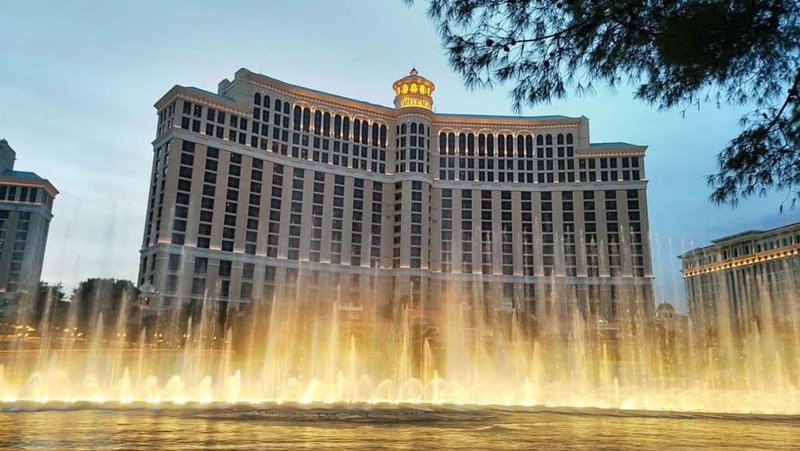 Everything from coins to food wrappers to diapers have tried to clog things up, and every day someone has to deal with the problem.More than 30 engineers are employed to maintain and operate the fountains daily. These are some comparatively unique positions for an engineer, because beyond the standard maintenance training, they are all dive certified because so much of their work takes place under water. 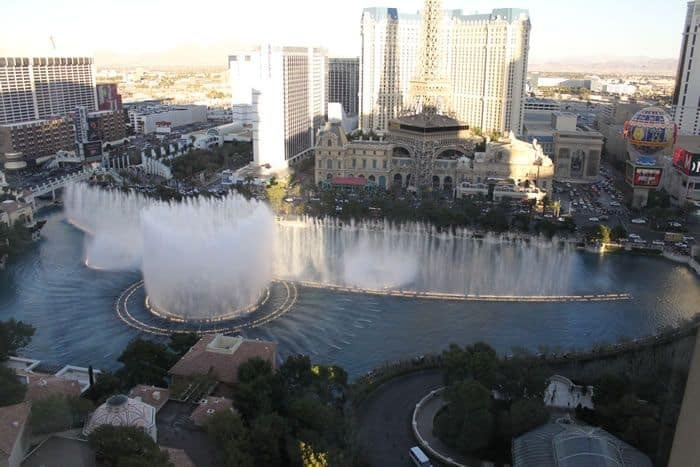 The fountains dancing above Las Vegas’ version of Lake Como consume about 12 million gallons of water a year, according to resort officials. 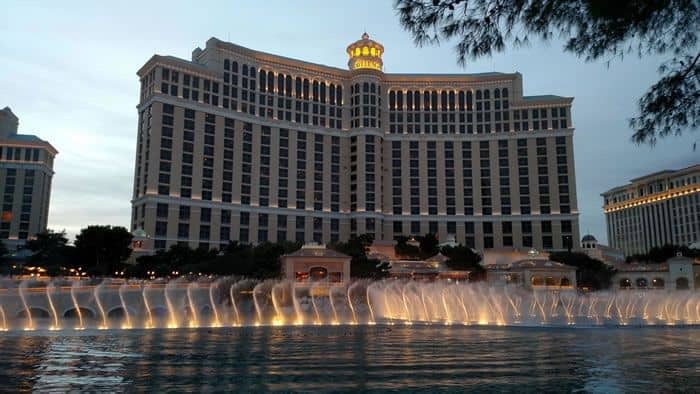 The Bellagio’s 8.5-acre lake holds 22 million gallons and is replenished annually with another 12 million, representing the amount lost to evaporation, leaky pipes or really thirsty ducks. 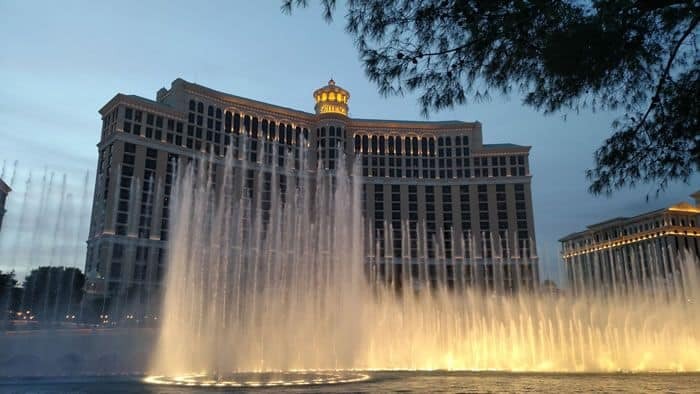 Assuming evaporation is responsible for that entire amount, that would break down to 1,200 gallons lost in each of the roughly 10,000-plus fountain shows performed throughout the year. 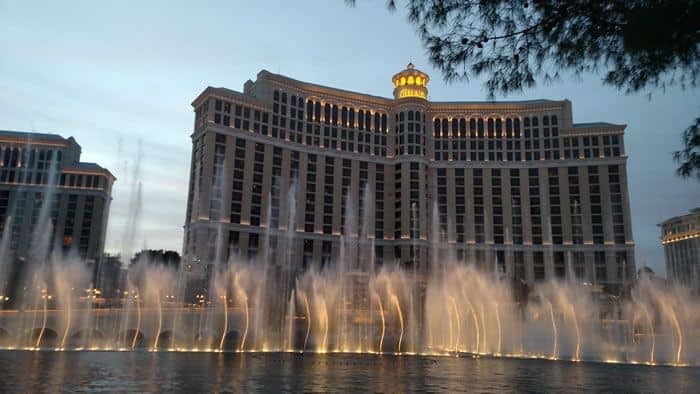 It’s worth noting though that the lake is equipped with sensors that shut off the fountains when winds would blow water beyond its borders. 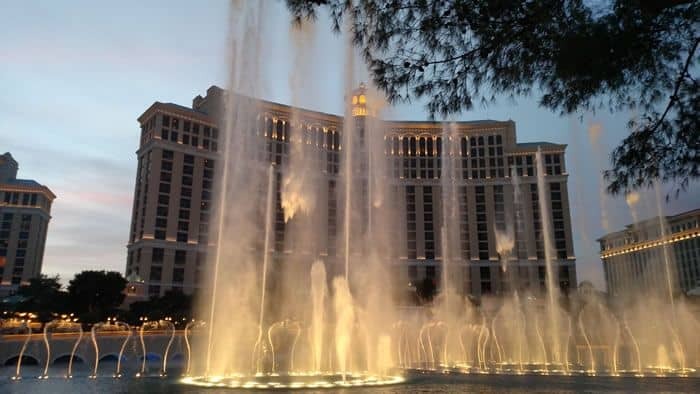 The fountains are always Exhibit A for critics of the metropolitan area’s water use and the equity of conservation requirements. 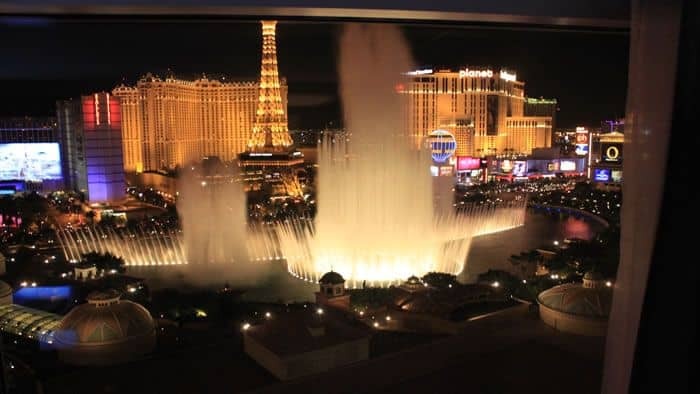 While there are legitimate questions about the logic of building a city of 2 million souls in North America’s driest desert, singling out the fountains as representative of the region’s water problems isn’t entirely fair. 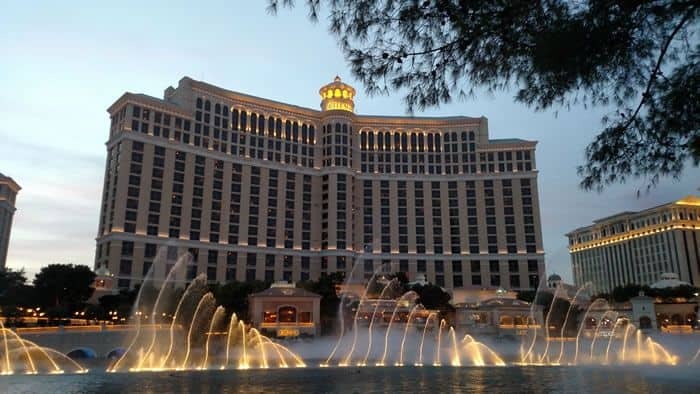 The Bellagio uses water from a private well beneath the property — the water source for the old Dunes golf course — and thus does not further strain the Colorado River, the primary source of water for the Las Vegas Valley. *Please note patio seating is not guaranteed and is on a first come, first serve basis. 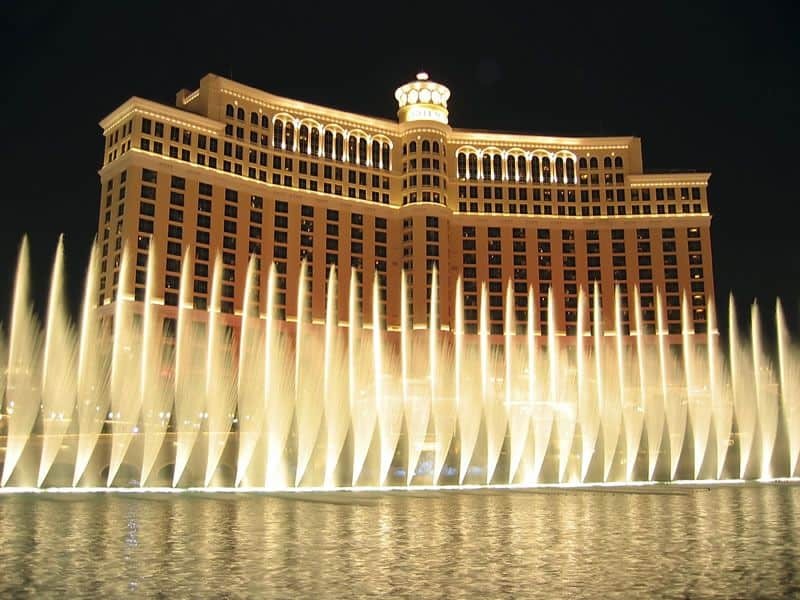 Bellagio Fountains is a free thing to do in Vegas and one of the best Free Shows in Vegas!